The pursuit of pure speed has resulted in a number of oddly shaped cars. 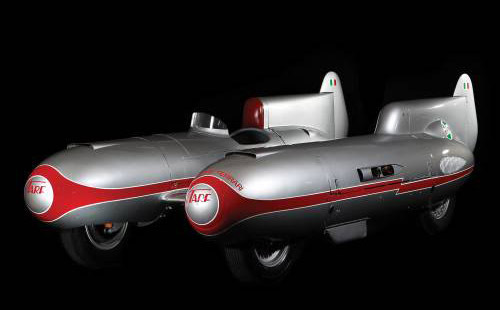 But perhaps none more so than the 1951 land speed record car designed, built and driven by Piero Taruffi. 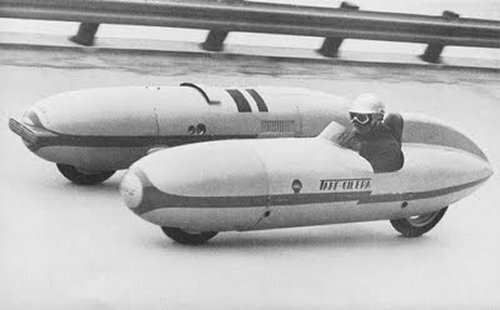 The car goes by several names, including the Italcorsa and Tarf II - it also got the fitting nickname "Bisiluro" (twin torpedo in Italian). Piero Taruffi was an Italian racing driver and engineer. His passion for fast machines began with motorcycles, but he soon moved on to cars, and his considerable talent allowed him to pilot some of the fastest machines of the era from numerous manufacturers including; Alfa Romeo, Bugatti, Cisitalia, Ferrari, Maserati and Mercedes-Benz. During his racing career he notched up several victories - including the last ever Mille Miglia. He also broke several dozen speed records. The Tarf II was based on an earlier design called the Tarf I. Both cars featured the same twin boom design, but the Tarf II was fitted with a larger 1,720 cc Maserati four-cylinder engine which developed 290 horsepower thanks to the addition of a supercharger. A chain transferred power to the rear wheel. 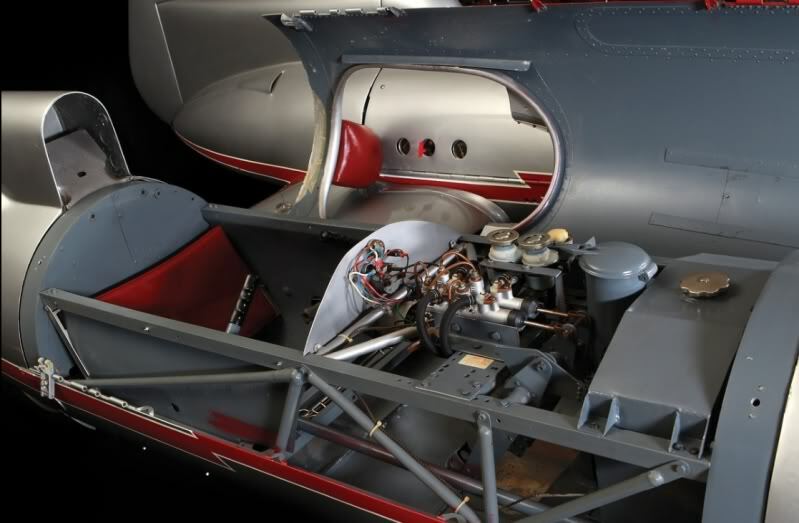 The Tarf II's steering system was of an unusual design. The narrow cockpit meant there wasn�t space for a steering wheel. So instead the Tarf II was fitted with two levers either side of the driver which were used for directional control. 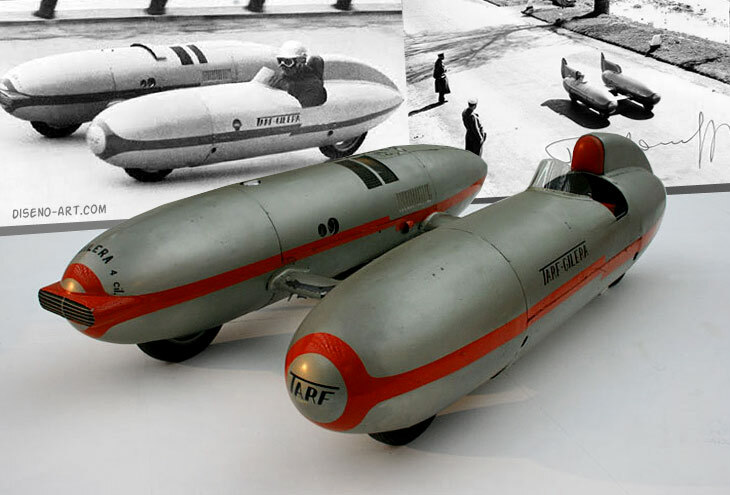 On 20 March 1951, Taruffi broke two world records with the Tarf II. Achieving the fastest �flying mile� with an average of 185.49 mph (298.507 km/h), and the fastest "flying kilometre" with 180.55 mph (290.552 km/h). 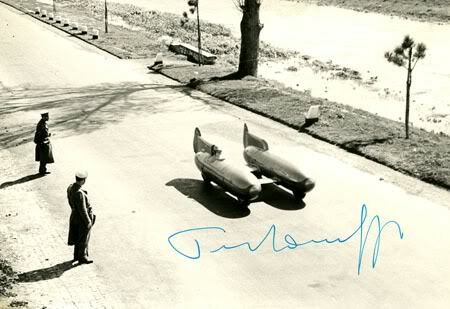 On 15 January 1952, Taruffi broke the 50-mile record at 144.00 mph (231.744 km/h). On 3 April 1952, four more records were broken: 50 km at 140.87 (226.700 km/h), 100 km at 139.66 mph (224.747 km/h), 200 km at 136.0 mph (219.833 km/h) and a one-hour record at 135.10 mph (217.414 km/h). After 1952 the Tarf II stopped setting records and was retired to Taruffi's automotive collection. Later the car found its way to Australia, and then in 1986 it turned up at the York Motor Museum in western Australia - without its engine. It was restored for museum display and at the same time fitted with a Ferrari 246 Dino V-6 engine. Between 2002 and 2008, the Italcorsa Tarf II was displayed at the Fremantle Motor Museum, also in Australia. In 2012 the Tarf II was sold at auction to an unknown buyer for 89,000 EUR ($122,000 / �73,600) below its reserve, and well below its estimated value.